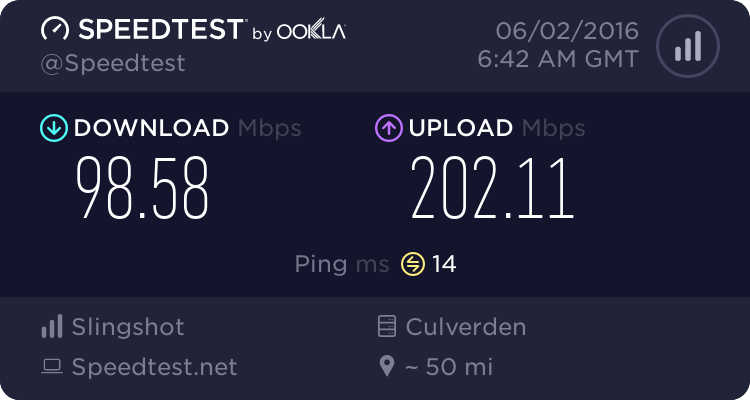 200/200 Speed tests, is this OK? Forums › Orcon and iServe › 200/200 Speed tests, is this OK? Here's my status on my WiFi connection. WiFi definitely can go extremely fast if you get the right wifi adpater for your PC and have a newer AC3200-capable AP. I understand AC3200. I also understand that I can move files around to / from the NAS via WiFi at about 35MB / second.....which is nice. I guess I'm the other 1%. Plus the whole family streams HD video off the NAS via wifi......so yeah....I guess we're different. im guessing your nas is connected via a single ethernet cable to your AP? which is limited at 1000mbps. what modem is it? NF4V? Yes, latest revision apparently, I had a NF4V that I just sent back as it was my original and Orcon said it was not capable of the 200/200 speeds. Possibly a bit out of left field but have you tried a different Ethernet cable from the ONT to the router? Yes I was, now can only get 100/200, but strangely it is almost exactly 100/200 every time which makes me think it is being hampered by a set limit. 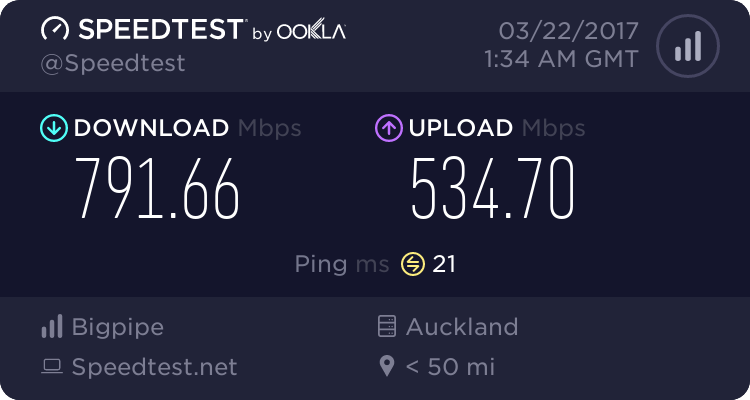 I had a similar issue with another ISP and it turned out to be a fault with the router...I was consistently getting 70Mbps down, despite being on a 200 connection (and having seen 200Mbps in the past, with no config changes made). After lots of attempts to fix (calls to ISP to check plan, Chorus 'Non-van roll' checks, direct connection to router etc. ), the router was finally replaced and put into the same setup (i.e. just swapped all the cables into the new router) and it was all back to 200Mbps down. hence why i stronly suggest you try using your PC/Laptop as your PPPoE connection straight into the ONT to rule it out. Orcon uses DHCP not PPPoE (Too much overhead with PPPoE). However you need your PC to 802.1q vlan 10 also.